For many years Old Bridge Township’s Raceway Park has awarded its top riders year-end rewards. The famous point’s series jackets are a coveted item among the Northeast’s best motocross racers. 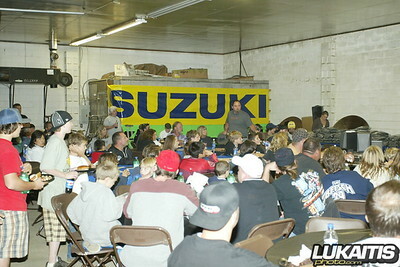 At the end of 2006 track manager Rich Schmidt decided to step it up a notch and host a year-end BBQ and awards banquet. The first one was a low key affair held in a garage at the racetrack. The event was so well received that for 2007 they did it again. 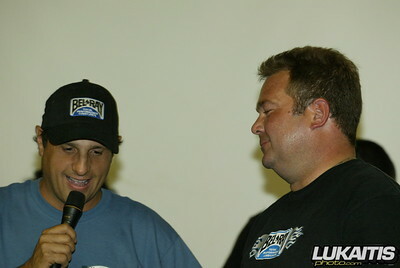 The 2007 BBQ portion of the evening was sponsored by local race team MC Motorsports Racing and their participating sponsors. Again held in a large garage on the track’s property riders and their families were treated to free food and drink as well as excellent desserts. The top 5 riders in each class were awarded the points championship jacket as well as other prizes from series sponsors MSR, FMF, Scott, Acerbis, No Toil and Bel-Ray. The voice of Raceway Park, Rich Trevelise, was the emcee for the event and conducted interviews with the top riders as the rest of the staff handed out the more than $8000.00 in product prizes. The biggest winner of the night was double expert class points champion, Ryan Gainey. The Mt Holly Racing KTM rider won both expert class points championships. Gainey was joined on the championship podium in both classes by Dakota Kessler in second and Ronnie Stewart in third. Other multiple class championship winners on the evening were Jimmy McIlvaine (30 and 40 plus expert) Jacob Hartranft (85cc 7-11 and Junior Mini), and Jesse Pierce (85cc 12-13 and Supermini). The Hartranft and Pierce families both went home win other championships as well as younger brothers Keith Pierce (65cc 10-11) and Brandon Hartranft (65cc 7-9) took championships in their respective classes as well. The low key event was a great success as a good time was had by all. Check out racing at Raceway Park in 2008 and you can be picking up your jacket next October at the third annual BBQ and Awards Banquet.